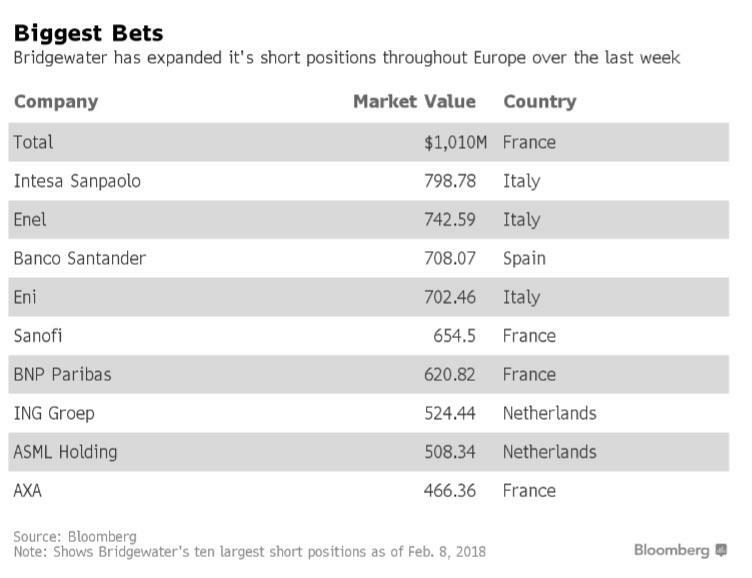 Last October, Italy's government was angry when the world's largest hedge fund, Ray Dalio's Bridgewater unveiled it had amassed a sizable $713 million short against Italian financial stocks, its biggest disclosed bearish bet in Europe. Then last week, and just one month before Italy's March 4 elections - which the broader market stubbornly refuses to acknowledge are a risk factor - Bridgewater tripled down on its bearish bets against Italian banks and insurers, making the position the largest thematic short carried by the world's biggest hedge fund. As we reported last Thursday, Bridgewater boosted its bearish bets against Italian companies to $3 billion and 18 firms, up four-fold from just over $713 million in early October, further infuriating Italian authorities. As Bloomberg added, Bridgewater's bearish bets against European companies as a whole totaled $3.3 billion, spread among 20 names. In addition to his previous negative exposure, Dalio disclosed a short position in transport-infrastructure provider Atlantia and added to its largest short bet, against lender Intesa Sanpaolo SpA. The growing short comes just days after Dalio told a Davos audience that "holding cash is now stupid"... and literally days before the biggest market crash since Lehman. 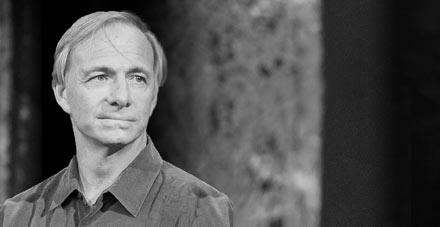 Fast forward to today, when Dalio's bearish fascination is starting to get a little concerning, because according to the latest Bloomberg summary, Bridgewater now has at least $13.1 billion in European Union shorts, quadrupling the $3.2 billion short from last week, and over 18 times more than the fund's original position last October. In the past week, Bridgewater put more than $1 billion to work betting against oil giant Total SA - making it the firm’s largest disclosed short holding in Europe. As Bloomberg notes, Europe's energy titan has been riding out the biggest industry downturn in a generation by selling assets and cutting spending. The hedge fund also started a bearish Airbus SE position, investing about $381 million against the aircraft maker. Among other short positions, it disclosed wagers against BNP Paribas SA, ING Groep NV and Banco Santander SA. Amusingly, since the Feb. 8 regulatory filings were made public, Total fell 1% as markets slumped, while Dalio's other shorts, Airbus, BNP Paribas, ING Groep and Banco Santander sank roughly 2%. "We are in this Goldilocks period right now. Inflation isn’t a problem. Growth is good, everything is pretty good with a big jolt of stimulation coming from changes in tax laws. If you’re holding cash, you’re going to feel pretty stupid." And as Dalio was dissembling, he was quietly assembling Bridgewater's biggest ever thematic short in his fund's history. So yes, perhaps if you're holding cash, you will feel pretty stupid eventually, but not after last week's global market plunge; however, you will certainly feel much dumber if you actually believed Dalio.